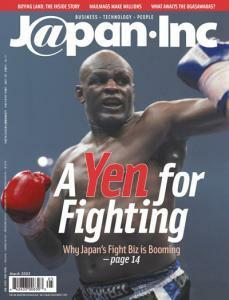 On the cover: Enersto Hoost battling in the K-1 World GP 2002 Final in Tokyo. He eventually won the championship and the $400,000 price money. Buying Land: The Inside Story - Mailmags Make Millions - What awaits the Ogasawaras? Getting around in Tokyo can be a hassle!! Did you know that NTT had held a de factor monopoly in the fixed phone business for the past 100 years? Gregory Clark argues that the usual arguments about what ails the Japanese economy are off the mark. MBOs are becoming a viable tool for Japanese firms looking to break with foreign parents. Girls Walker shows that young women will even use their keitai to shop till they drop. Roland Kelts takes us into the heart of Japan's fight world, a big, bad, booming industry that is branching out overseas. Does Paradise Need a Parking Lot? The Ogasawaras are Tokyo's farthest-flung suburbs and some of the world's most exotic islands. That's why developers have been toying with the idea of turning them into another Waikiki. Real Estate: Part 1 - This two-part feature brings you analysis of Japan's land prices from real estate expert Stefan Whitwell and a firsthand account of what it's like to buy land as a foreigner from Robert Juppe. Reflation and gold loom on the horizon, says analyst Darrel Whitten. Sleeper trains, the bowling fad, miso soup preferences, taxi mileage programs and calling the cops.